I’m a checklist guy. This week, I realized that sometimes I need to have things on my list that are easy to accomplish for the emotional uplift of completing tasks…so I did that. And then I got to thinking; why do I do that? When I graduated from college, my parents gave me a day planner from Franklin Covey. For those of you who aren’t familiar with Stephen Covey, or the organization he founded, they are the source of 7 Habits of Highly Effective People, which has been my organizational guidebook for over 20 years. Since that graduation gift, I’ve used a Franklin Planner every single year in every single professional environment, using every available format that Franklin has offered. 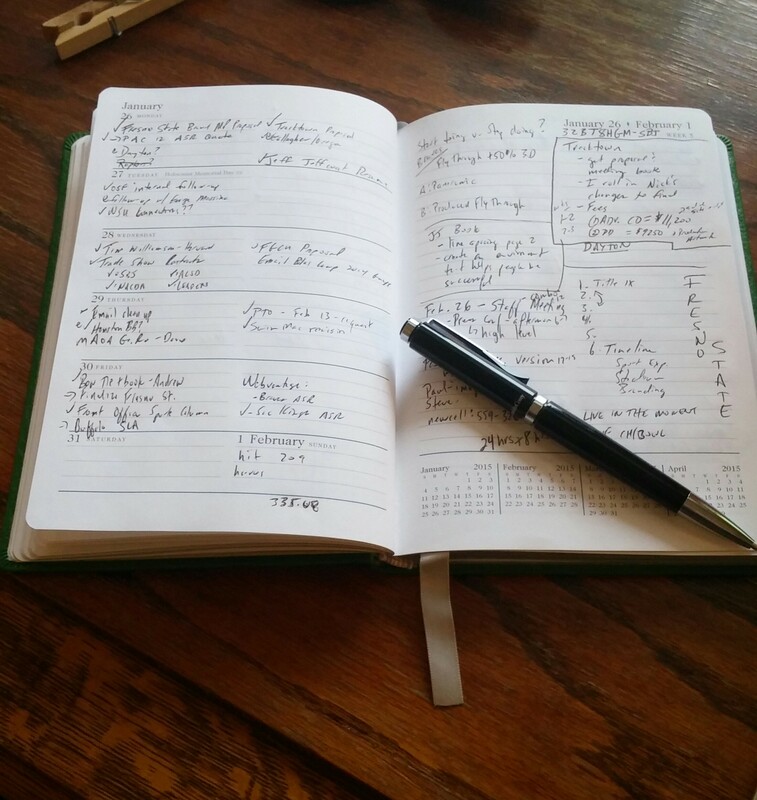 I’m now using a custom bound, leather covered 2015 planner that you see above. What hasn’t changed is the system that I use to set priorities for my day and week, which comes directly from 7 Habits. First, I work through things that are URGENT and IMPORTANT. These usually don’t even make it on to paper, other than maybe to note that I did them. In this category are things like a client request that is time sensitive for them to execute a contract, or a review of an internal document that our team is working on today. These things might include confirmation of an appointment or a note to a friend or client. Second, and where I spend the most time, are items that are IMPORTANT but NOT URGENT. I typically keep this as a weekly list, that is accompanied by notes, because they are often projects that are going to take larger amounts of my time or have multiple steps. I often work on these in several blocks during the week. In this bucket falls things like building proposals, reviewing final deliverables on a project before a client sees them, and preparing in person presentations. The third most important set of things, and the one that receives the most ‘daily checklist’ real estate in my planner are the URGENT but NOT IMPORTANT. These tasks are things that I might forget to do if I didn’t write them down, but that are time sensitive. Tasks such as booking travel (which gets expensive if not done urgently), inputing data into our business tracking software, and personal errands that need to be done at a certain time fall into this bucket. Today’s list included finalizing details of a meeting schedule for later in the week, booking travel for a trip next week, and picking up birthday presents at the bike store (tomorrow is my daughter’s bday). These are the ones that send relief through my body when they get a check mark next to them! Finally, the time suckers. NOT URGENT, NOT IMPORTANT tasks don’t ever get on paper. Not writing these things down, for me, makes them less of a temptation to cut into time better spent on valuable personal or professional pursuits. In the long list of things in this category you’ll find: shop online, check Facebook or Twitter, clean up my email inbox, and check last night’s scores. That isn’t to say these never take up time in my day; I just don’t give them the authority in my life that comes with being written down in my planner. So, why the planner and the checklists? I think when I reflect on it I find that it really is probably about three things: control, order, and goals. When you’re in sales, you don’t have a lot of control over your environment and knowing what I’m accomplishing and when gives me a sense of control I crave, reducing my desire to control other things in my life. I’m by nature someone who likes order, and so is my wife, which is why our kids’ closets are organized by item type and color. If there is one thing I know about myself above all others, it is that I’m a goal-oriented person. When I have goals in front of me, I stay in better focus on what I have to do TODAY to accomplish those goals. Having things on paper that are little, ‘mini-goals’ to accomplish keeps me plugging through the week and makes me feel satisfied at week’s end. Time to go ship this computer back to the office – it’s on the list and needs to be checked because they need it there tomorrow! ← My Future’s So Bright, I Gotta Be Patient? You are like dad and me when it comes to the checklists. And undoubtedly, checking something off is a major feel-good – doesn’t matter what it is!